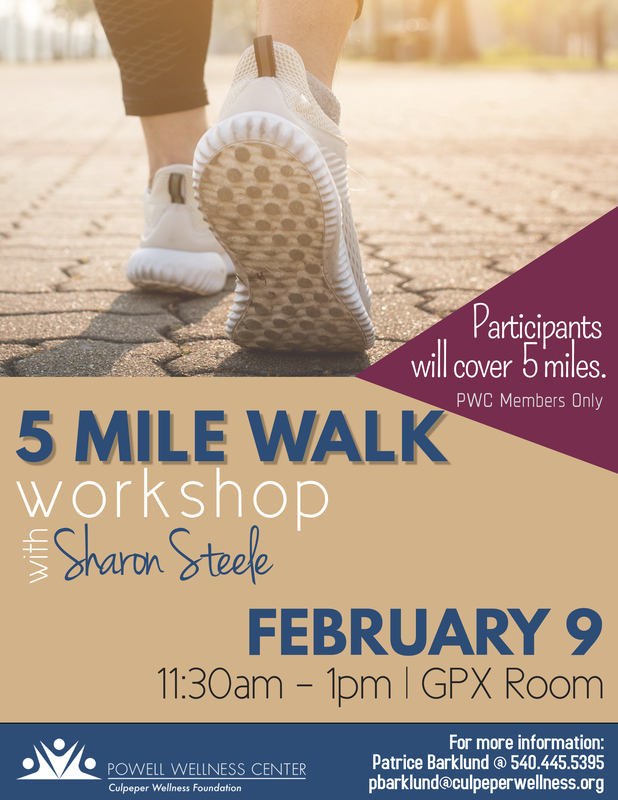 Lace up your athletic shoes and join fitness instructor Sharon Steele for a 5-mile walk workshop! Did you know that walking is one of the most simple ways to get fit? A regular walking program can deliver a host of benefits, identified by the American Heart Association as: reducing your risk of coronary heart disease and stroke; improving your blood pressure, blood sugar levels and blood lipid profile; maintaining your weight and lower obesity risk; enhancing your mental well being; and reducing risk of osteoporosis, breast and colon cancer, and Type 2 diabetes. Participants will walk 5 miles. Please wear comfortable clothing and footwear. Monday through Thursday: 5:30 a.m. to 9:30 p.m.
Friday: 5:30 a.m. to 9 p.m.
Saturday: 6 a.m. to 3 p.m.
Sunday: 8 a.m. to 3 p.m.
© 2018 Powell Wellness Center | Site designed & developed by K Art and Design, Inc.